radha marcum | Is your biz suffering from these 3 kinds of isolation? Content ruts happen. Strategy gets stale. It’s just part of the deal, whether your company is a fledgling venture just spreading its wings or is an established leader, an elephant matriarch. Ruts are inevitable. Getting stuck in them is not. If there’s one thing that my experience has taught me it’s that no person, no venture, can be its own community. We may need to isolate ourselves to incubate new ideas, but those ideas can never really flourish without refining and cultivating our ideas in community. No one, no venture can be its own guide. Isolation breeds staleness, sometimes failure. Content marketing is no different. 1. Isolation from culture. The venture is simply not paying attention to prevalent themes and opportunities for conversation with their audience and other thought leaders. 2. Internal isolation. The content marketing folks work with too much independence. Marketing and sales aren’t talking. The executive team or managers are far removed from any content marketing strategy. 3. Isolation from other businesses. This is a big one and so often overlooked. The company isn’t benefiting from conversation with a larger community. Without a strong circle of other businesses, a venture has very little chance of discovering or maintaining its unique offering, unique voice — absolutely essential to content marketing. These are super common obstacles. They’re at the root of ruts. And I see them time and time again in the businesses that hire me to help with strategy or execution of their content. 1. 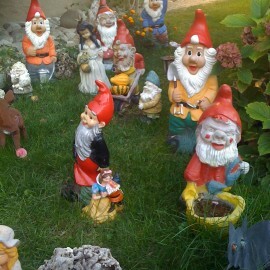 Stop rearranging the gnomes. (You know, all of the little things that keep you busy and distracted from the big picture.) Look at the whole garden. Get clear on strategy. 2. Sign up for a free 30-minute consultation with me. Absolutely no strings attached. 3. Join other businesses in a Content Marketing Focus Circle. Next circle starts June 11th! Sign up by Friday, May 30th for a 25 percent discount.